Historically, candles were made in numerous small workshops from expensive beeswax or cheap tallow (purified animal fat) which gave a poor light and released smoke and unpleasant smells. Candles can also be made using vegetable fat including palm nut oil. One of the British government’s alternatives to the slave trade was the encouragement of palm nut production in West Africa. The nuts were processed locally and the dark orange-brown coloured palm oil was exported to Britain where it was used in the soap industry. William Wilson, a London-based Scotsman and former Russian trader, took out a licence on an 1829 patent for the hydraulic separation of coconut fats and in 1830 set up as candle makers with a partner, Benjamin Lancaster, under the made-up name of Edward Price & Co. (It is thought that they did not use their own names as they did not want to be associated with a very low-class trade that involved dead animals and unpleasant smells.) The pair built a candle factory at Vauxhall with a crushing mill at Battersea and invested in a 1,000-acre coconut plantation in Sri Lanka. Initial sales of the coconut candles were not impressive but by 1840 Price’s had developed a composite candle made from a mixture of refined tallow and coconut oil. It was introduced just in time for the public to celebrate Queen Victoria’s wedding in the then tradition way of putting a candle in their windows. Later William’s son George experimented with discoveries made by the French chemist Chevreuil. Chevreuil had found that mixing strong alkalis with vegetable or animal fats caused the liquid to separate from the solid components. This process, known as saponification, was already used by soap makers but had not been applied to candle making. George added a further distillation using heat and high pressure to produce a harder, pure fat known as stearine. This was excellent for candle making as it burned brightly without smell or smoke. By-products of the stearine process included light oils and glycerine. Price’s soon found uses for these by-products, which made valuable contributions to the company balance sheets. Using the new process, candles could also be made from other raw materials including skin fat, bone fat, fish oils and waste industrial grease. 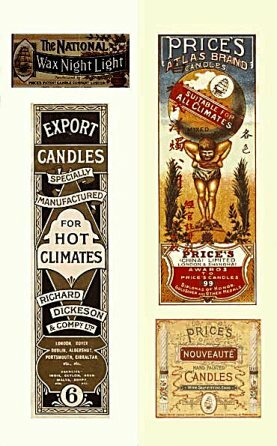 The original Edward Price & Co. became the Price’s Patent Candle Company in 1847 with about 84 staff. In October 1849 Price’s produced twenty tons of coconut candles worth £1,590, and about twelve tons of other candles worth £1,227. Palm oil was landed at Liverpool and in 1853 the company decided to save on transport and handling costs by building a second factory on a green field site at Bromborough Pool. Price’s was a benevolent company, so when setting up the Liverpool factory it started building a village for its employees. This model village was built in stages but eventually comprised 147 houses, a church, institute, shop and library. The Price’s concept of model villages inspired Port Sunlight (Lever 1880s) and Bourneville (Cadbury 1890s). Prices also introduced an educational programme for staff, a profit-sharing scheme in 1869 and in 1893 a contributory employee’s pension scheme. 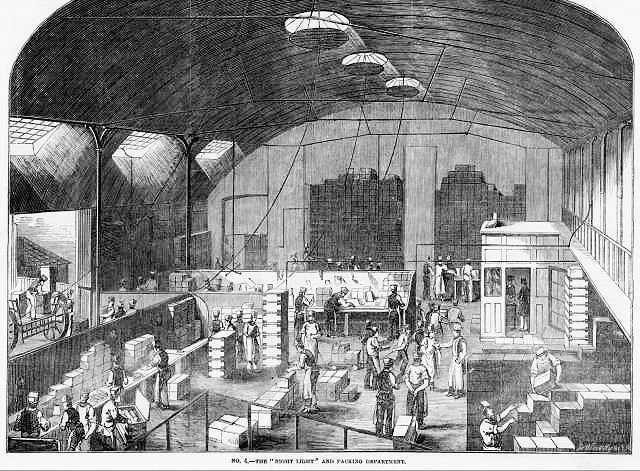 Price’s developed and improved methods of mass production and by October 1855 the quantity of candles the firm made in a month had risen dramatically to 707 tons, worth £79,500. Paraffin wax was first used in candles during the 1850s but initially take-up was slow with only about a 12% share of the market in 1870. But by 1900 paraffin wax candles had a 90% share of the market. In the late 1850s Price’s cracked oil from the oil fields of Burma into various products including paraffin and kerosene which the firm exported to the USA. In 1859 oil deposits were found in Pennsylvania and the market collapsed, leaving Price’s with a huge stock of crude oil. Using their experience in light oil production, Price’s developed many new lubricants including Motorine, a brand that dominated the UK motor oil industry in the early 1900s. What had started as a relatively small operation in 1830, twenty-five years later had become a national household name employing 2,300 staff of which 1,200 were boys. By the end of the 19th century it was the world’s largest manufacturer of candles exporting to all parts of the empire. But UK demand was beginning to lose out to other energy sources, and starting in 1910 Price’s set up candle factories in Johannesburg, Shanghai, Chile, Rhodesia (now Zimbabwe), Morocco, Pakistan, New Zealand and Ceylon (now Sri Lanka) to serve local demand. In 1919 Price’s was taken over by Lever Brothers, which wanted to diversify into a wide range of fat-based products and saw Price’s as a direct competitor with a good range of products, extensive industry knowledge – and a factory next door to Port Sunlight.